Giveaway Winners & Provo July!! First off...thanks for all the sweet comments on my last post about Casey. I really truly appreciate it. The doctor that performed the echo said he saw nothing abnormal! Praise the Lord...I was more worried than I even let myself believe about this. They are still going to send the test info to a cardiologist just to be on the safe side. But, we are all breathing a sigh of relief on this one! Secondly...here are my radomly picked winners of the SEI and Cosmo Cricket paper packs! I wish I had the money to send each and every person a little RAK! I can't wait for Sassafras and Pink Paisley!! Oh and Maya ROad!! I am LOVING everything they've got coming out!!! 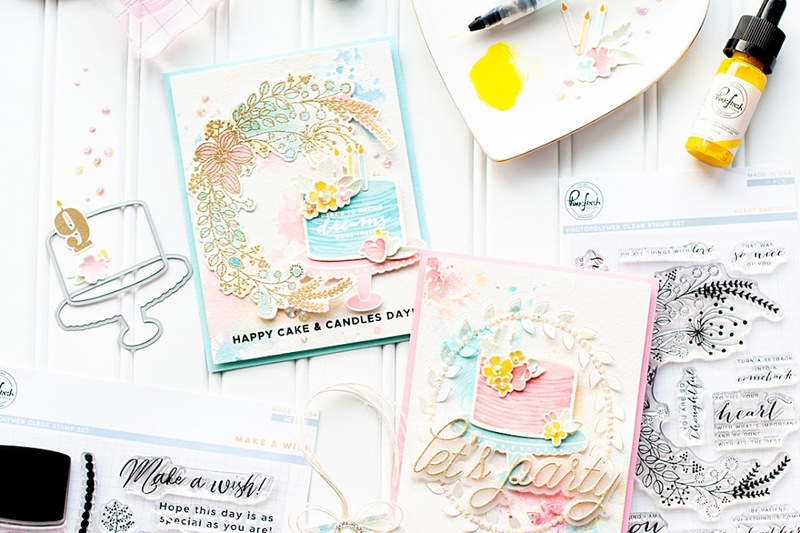 I would LOVE LOVE LOVE to get my hands on those hello sunshine papers .. they are sooo me!! I haven't seen them around here anywhere yet. You rock for doing this Lea! YUMMY!! All the new CHA stuff looks fabulous.. but i'm really looking forward to seeing the new CBX stuff.. I haven't seen anything new from them in a long time.. so excited to replenish my stash of CBX!! LOL!! My choice would be the SEI Chocolat, I have the other on order.. lol! Please email me your address information to jnllawson at bresnan.net. (You get spam if you type out the entire email address- just an FYI as to why I typed it out completely). 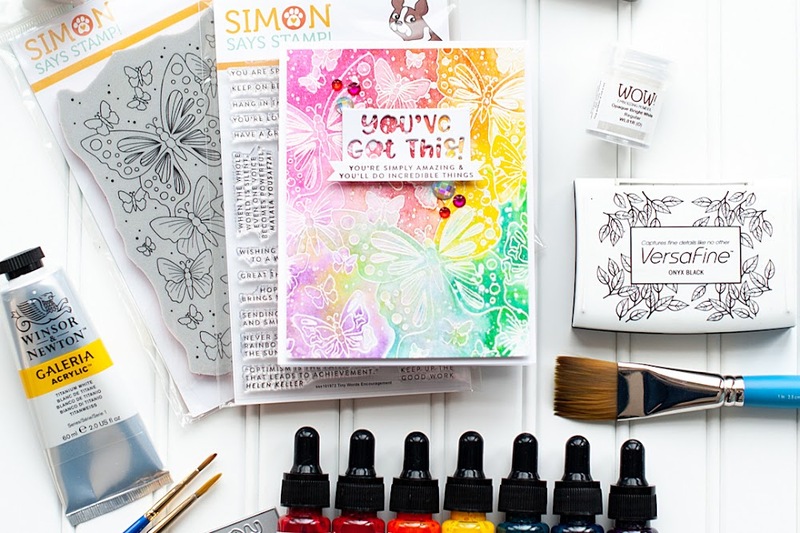 And last but not least, I have my July projects for Provo Craft to share today! 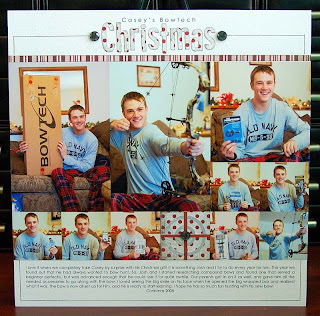 First up is a layout about Casey's Christmas present last year. I used the Solutions Street Signs cartridge for the title, and the Solutions Indie Art cartridge for the bullseye cut out. I like how it kind-of looks like a present as well! For this card I did a combo of Cuttlebug and Cricut. I used the Swiss Dots embossing folder on white cored cardstock, and then sanded it a little to really bring out the embossed dots. 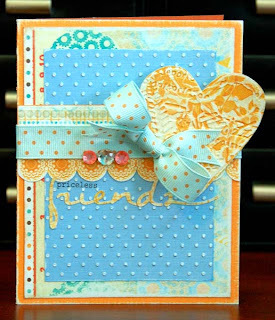 I also used the Textile Hearts Combo diecut/embossing folder to make the heart accent. The embossing is very subtle because I decided to use patterned paper for it. Lastly, I used Opposites Attract cartridge to spell out "friends" in the sentiment. 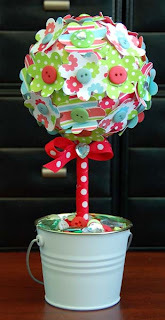 My last project is this cute little floral topiary. I used the Walk In My Garden cartridge, and cut out 13 flowers with middles from each of the three different sheets of patterned paper. I placed the flowers randomly all over the styrophome ball, and then filled the rest in with all the middles of the flowers that were cut out as well. Then I accented with buttons and rhinestones, and put it all together. Such a cute little project...I like how it turned out! That is all for me right now! I hope everyone has a wonderful weekend! Wonderful news about your brother! Yay me!! LOL!! Thanks *SO* much, Lea!! Great to hear that your brother is doing ok! And that topiary is to cute, love it!! Thanks be to God Lea! So happy for your wonderful, blessed news Lea! That is great news about your bro! Thank God!! I am so glad to hear the good news for your little brother! Awesome layout and the tree and card are both gorgeous! yay about your little bro! love your happy little topiary! So happy about your brother! Congrats to the winners and I LOVE that topiary! SO flippin' cute!!! This is darling. I love the colours and the Topirary tree is amazing. That looks difficult to do too. What wonderful news about your brother! It's so awesome to be able to praise God for His goodness! I really love your work and I've left something for you on my blog so please feel free to visit my blog I would like to thank you for the sweet comments you left on my blog. p.s. - Praise God for the good news on your brother! These are all amzing Lea, love how you used the Cricut! 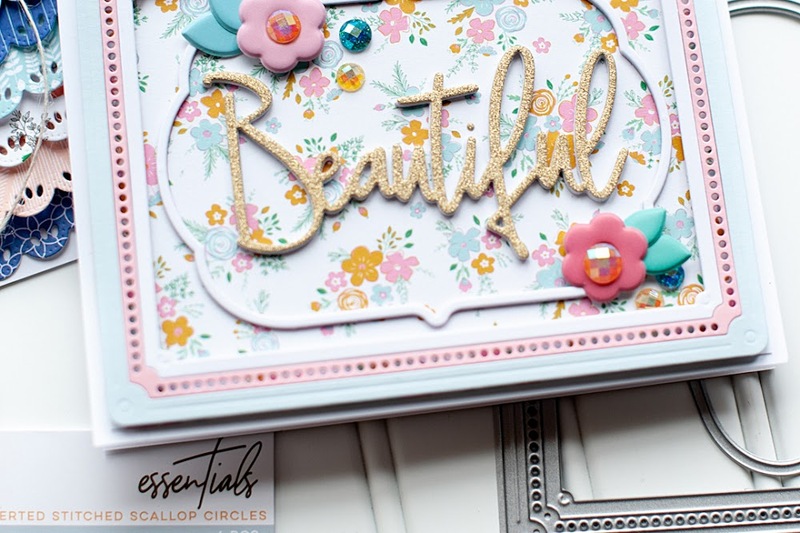 CPS #75 brought to you by Rubbernecker Stamps! Basic & Angst....come on down!